Looking for a camera that shoots great video? Wondering what other gear you need to make cool videos? You're at the right place! Here you'll find our full list of recommended video gear. Most of the stuff on this list is gear that we currently own and use for making videos. Warning: just like photography gear, researching "the best" video gear can become a bit of a black hole. I'll save you the trouble right now and let you know that there is no perfect video camera out there. In fact with a lot of the equipment here you're always making compromises of some sort. Don't let video gear slow you down - just get out there and make videos! If you find these recommendations helfpul you can help support Photography Concentrate and our family by purchasing through the affiliate links on this page. Most products have links to both B&H Photo and Amazon.com (both stores usually have the lowest available price). It costs you nothing extra to purchase through these affiliate links, but it does give us a small commission. Anything you purchase after visiting the links will help earn us a commission. We hope you find this page helpful, and you have our heartfelt thanks for your support! This is our top recommendation for a photo/video camera. ​One of the biggest advantages of this camera is it's "dual pixel" autofocus during video. This allows for super fast (yet smooth) autofocus during video. It also has a flip out touch screen. Another advantage of this camera is that it's pretty good for photography as well. This is the main camera that we reach for when we want to shoot video. Note: a newer and more expensive version of the camera has been released (the Canon 80D). The 80D has more autofocus points, more megapixels, and adds a headphone jack. The 70D is still excellent value. 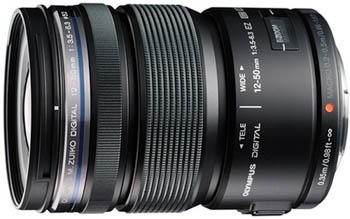 The 18-135mm is a great all purpose video zoom lens. It features super quiet (yet fast) autofocus during video. It also has image stabilization which is extremely helpful for shooting handheld. 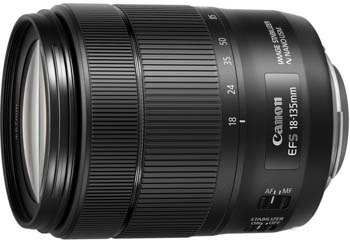 We currently use a Canon 24-105mm but it's not wide enough for all purpose use, so we also have a 10-18mm, but it's too wide! We're switching to the 18-135mm as soon as possible. Make sure to check your local classifieds for like-new used copies of this lens since it is often sold in kits with the 80D. 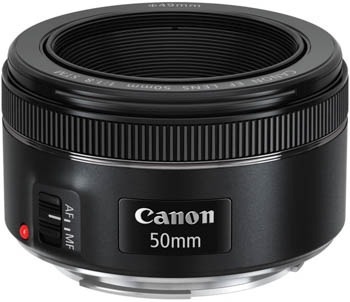 This is Canon's latest "nifty fifty". It's super affordable, and has quiet autofocus during video. It will help you get more cinematic shots with beautiful background blue because of it's wide maximum aperture (f/1.8). One downside is that it doesn't have image stabilization. This lens will also feel a bit too long for all-purpose use (80mm equivalent on the cropped sensor of the 70D). 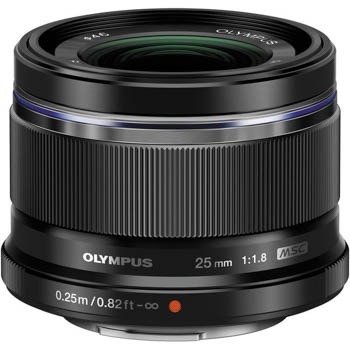 Note: we use the 50mm f/1.4 version of this lens which is a bit pricier, and doesn't auto focus as quietly as the STM version above. The biggest benefit of this camera is that it's very easy to get steady shake-free footage shooting hand held. This is because the camera features 5-axis sensor stabilization. Sensor stabilization by itself is superior to lens stabilization, but you also have the additional advantage of being able to put non-stabilized lenses on your camera and still get incredibly steady footage. The smaller size of this camera is also nice, and it also features a flip out touch screen like the 70D. A couple disadvantages are that the autofocus during video isn't as good compared to the 70D, and the controls to adjust exposure while shooting video are not very convenient (easy to adjust before/after recording - just not while recording). Good all purpose video zoom lens. It has an equivalent focal length of 24-100mm. It features dust and splash proof construction. It also features super quiet auto focusing during video. This lens will give you an equivalent focal length of 50mm. It's a super sharp lens that all allow you to get more cinematic shots with more background blur (because of it's wide maximum aperture, f.1/8). 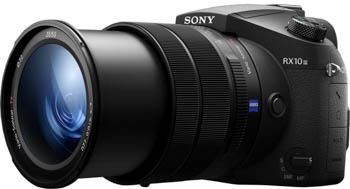 If you're looking to seriously shoot a lot of video then Sony is the way to go. The reason I'm not giving more space for their cameras is because the cameras themselves are quite expensive (notably their a7sII and a7rII), and their lineup of lenses are also pricey. They are probably not the best option as beginner video cameras. So what makes Sony so great? Well they are currently the only camera manufacturer offering 5-axis sensor stabilization with a full frame sensor. That means you're going to get super steady footage, along with a shallower depth of field. Their mirrorless cameras are also able to shoot at ultra high resolution 4K. Sony also has eye (not just face) tracking autofocus (which is a pretty impressive feature). A couple disadvantages of Sony cameras is that they don't feature a touch screen (which I find really useful for video). It also seems like getting great color straight out of camera is a weakness in Sony cameras, but you can always adjust color in post (especially if you're shooting with special color profiles). I also personally feel like the ergonomics, button placement, responsiveness, user interface and general usability of the camera isn't as great as what is offered by Canon. a7sII and a7RII - These cameras look pretty much identical. The difference between them is the sensor inside. 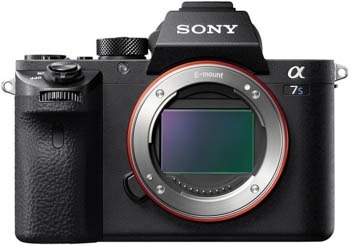 The a7sII is more oriented towards shooting video, and the a7RII is more oriented towards photography (with it's massive 42MP sensor). Both cameras have 5-axis sensor stabilization, and shoot 4K. 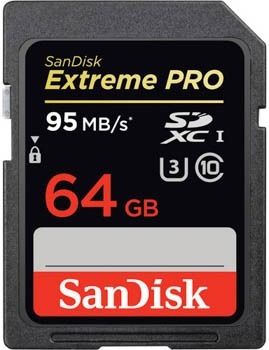 This is probably the best point and shoot option out there for video. 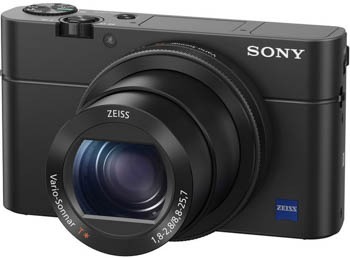 We use an older model of this camera (RX100III). I actually used it to film the birth story of my second son. It captures excellent quality video, and it's small size makes it easy to wear around your neck. I like that it has a flip up screen (instead of a flip out screen). The screen can actually flip 180 degrees so you can capture selfie video pretty easily. One disadvantage of this camera would be the zoom length which can feel a bit limiting (24-70mm equivalent). It shoots 4K video (limited to 5 minute clips), and also super slow motion HD. A neat feature of this point and shoot is that it has a built in ND filter which is extremely useful when shooting in bright outdoor light. This is an all-in-one monster video/ photo camera. It's kind of a cross between a DSLR / Mirrorless and a point and shoot. It has a massive 24-600mm lens. It also shoots 4K and ultra slowmotion video. The disadvantage is that lens isn't interchangeable. 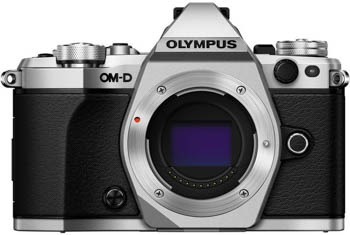 It uses a smaller 1-inch sensor instead of an aps-c or full frame sensor. It also doesn't have 5-axis image stabilization. The main advantage of this camera over the RX100IV is the longer zoom range, and it also has microphone and headphone jacks. It's also a fair bit larger than the RX100. Your cellphone is probably the most accessible video camera you own - and you'll probably end up taking more videos with your cellphone than with your bigger cameras. The iPhone 6s is capable to shooting 4K video as well as slow motion video (240fps). Now, one reason you might want to go for the larger Plus size is that it features optical stabilization, while the regular size model does not. You can get super steady hand held footage when shooting with the Plus model! 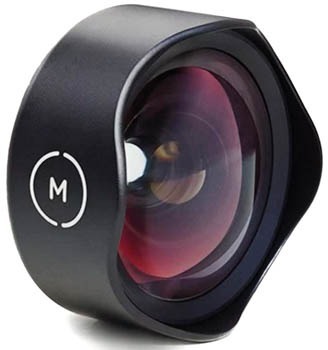 These fun/cool lenses attach to your iPhone so you can get wide angle, telephoto, or macro perspectives. They can definitely help you get variety with your shots and are useful for both photo and video. This little gadget will let you attach your phone to you a tripod. It kind of slides up to grip the phone and there there is a regular tripod thread at the bottom. We use a slightly larger version of this tripod (S6). 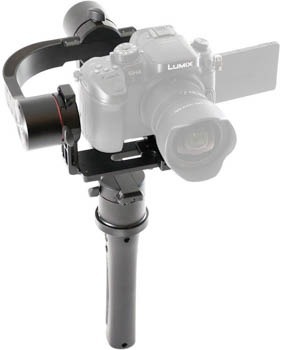 The video head is what makes it different than a photography tripod. It allows you get smooth pans and tilts. One feature that's nice about this tripod is that it has a levelling adjustment so even if all your legs aren't all even you can adjust the tripod head so that it sits level (huge time saver). It also comes with a nice bag. We use this tripod more for our product reviews in the studio. 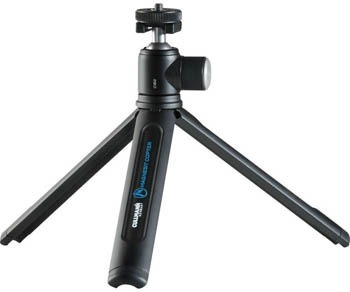 A monopod can give you more flexibility than a tripod because you can quickly move from one spot to another. It's obviously not as steady as a tripod, but it can be really useful helping you get steady footage with unstabilized lenses and cameras. 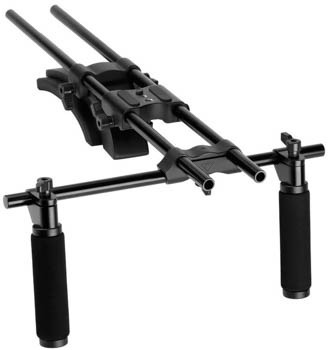 For most of the family videos that we've done for clients we use a shoulder support rig like this. We used a different model, but this one offers essentially the same features, is cheaper and better reviewed. I like really like the dual grip (they make some with single grips). The dual grips allow you to use both hands to stabilize the camera and it's also a bit easier to adjust camera settings (switching hands). 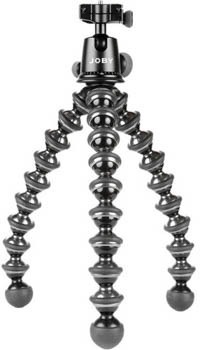 These funky mini tripods have become hugely popular. You can twist and bend the legs in any direction allowing you to wrap the legs onto different objects. To be honest I've never really used ours that much - but some people swear by them. 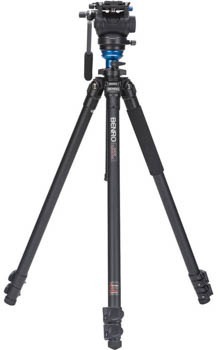 I prefer the folding mini tripod I mentioned earlier. It's nice to have one as part of the kit for the random times you might need it. This gadget helps you get steadier footage by using small motors to help actively balance your camera. It can help give you that "flying" look to your videos. ​We highly recommend getting this microphone in order to drastically improve the sound in your videos. 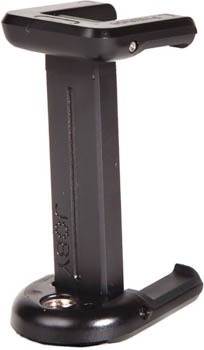 This is an external shotgun mic that sits in your camera's hot shoe (where an external flash usually goes). It's a directional mic (which means it picks up sound mainly from the direction that it's pointed in). This is a wireless lav mic. These are the kind of mics that you wear on your lapel. 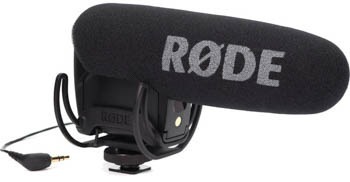 They're the best option when you need to record great quality audio of someone's voice for your video. For our studio videos we use a different model, but the ones shown here are a newer, and cheaper alternative (what I would purchase today). This is a recorder that you can plug microphones into (and then sync up the sound recording with your video in post). This is really useful for capturing audio from multiple sources simultaneous. It also records audio at a higher quality than your camera. We use an older, different model (DR-60D). 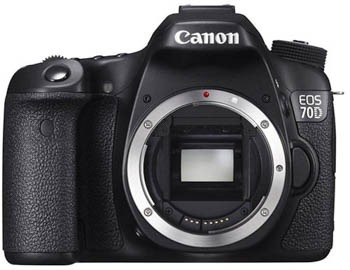 The DR-70D is what I would get today. What's neat is that you can mount your camera right on top of this unit. It's not as easy to mount on a camera, but it does have the advantage of doubling as a USB audio interface. 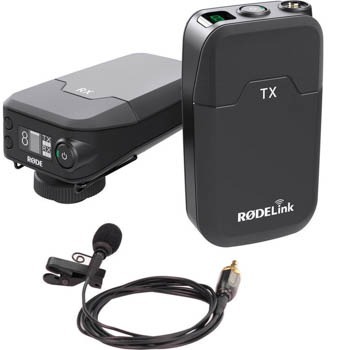 That means you can connect it to to your computer by USB and then microphones that are connected to the recorder can be used to record directly to your computer. This can be really useful for podcasting, or really any situation where you need to attach a microphone to your computer. You need to be able to monitor your audio to make sure you're getting a good recording. 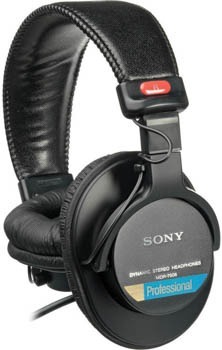 For quality and price these are the best value headphones you can buy, and are pretty much an industry standard. 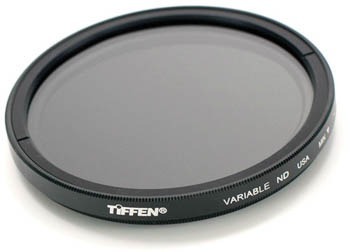 A variable neutral density filter is essential if you want to shoot outside in bright sunlight and maintain your desired shutter speed and aperture when shooting video. Video typically requires a slower shutter speed (1/50s) compared to photography which is where ND filters come in handy. Now here's a tip: ND filters are expensive. You can't get one for each of your lenses. What you need to do is buy a larger one (82mm, which I think is the biggest, is what I recommend). Then you can purchase step-up rings of various sizes which allow you to use that one ND filter on all your lenses. This loupe attaches over a DSLRs LCD screen using small bungee cords. It lets you get a much better view of the LCD screen and is extremely helpful when manually focusing. It's also really useful when you're shooting in bright light and you can't easily see the LCD. Finally, it also helps give your camera one more point of contact with your body (your eye!) so that you get get steadier footage. 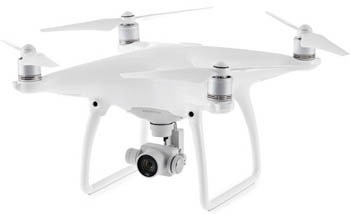 This quadcopter features a 3-axis gimbal stabilized camera that can shoot 4K video. That means you can get super steady, ultra high resolution video from the air! This quadcopter is so much fun to fly, and the footage you can capture with it will blow your mind. The original and ubiquitous action camera. 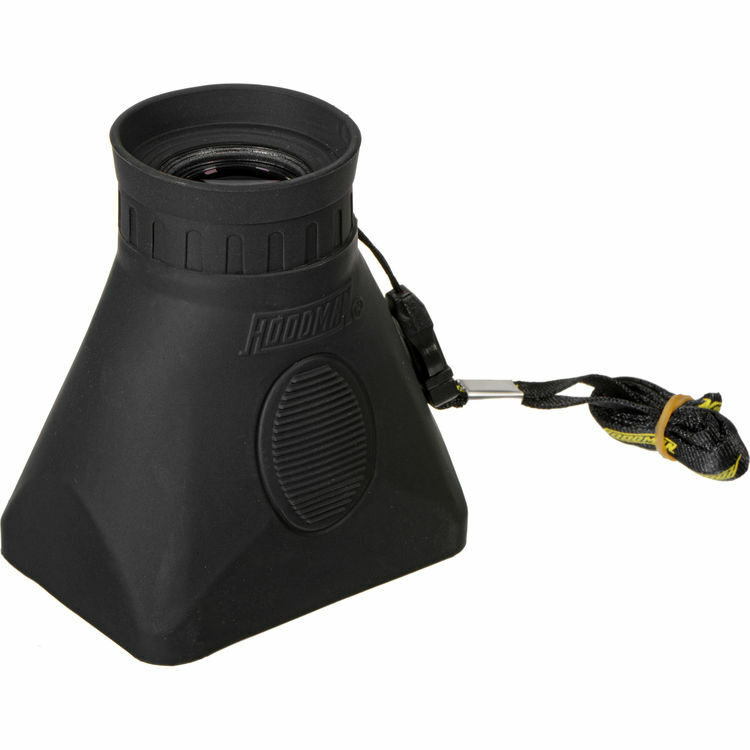 These cameras are useful in capturing POV perspectives for placing cameras in difficult locations. I've never really loved the quality of footage that comes out of it, and for the expensive price tag I don't think it's really worth it. Mine mostly sits around in my bag and I've thought about selling in countless times. 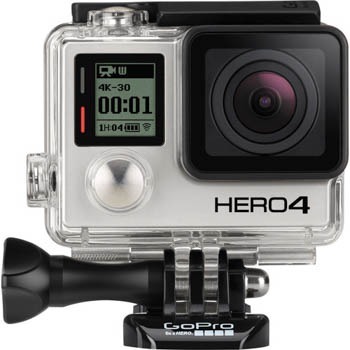 For a much cheaper alternative check out the SJCAMs which are essentially clones of the GoPro. They're about 1/4 the price and look like they do pretty much the same thing. 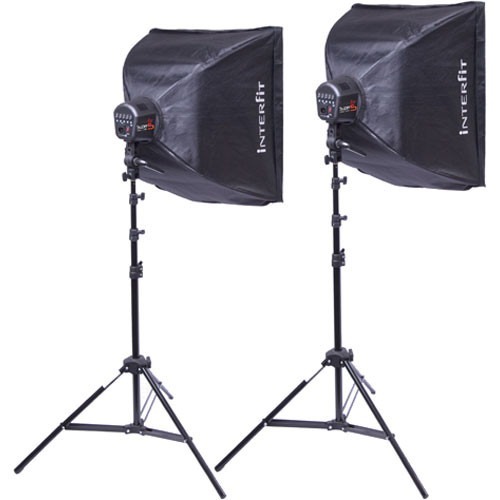 We use this lights in our studio for recording reviews and other videos for the blog. We also use them for a bit of photography. They work pretty well and they were relatively cheap (came with the light stands). I probably wouldn't try to use these for anything too serious. I don't think the color accuracy is really great with them (the sales page doesn't even have a CRI rating). I'm interested in trying out some L﻿ED panels, ones that have color temperature control - I think they would be really useful for on location video. 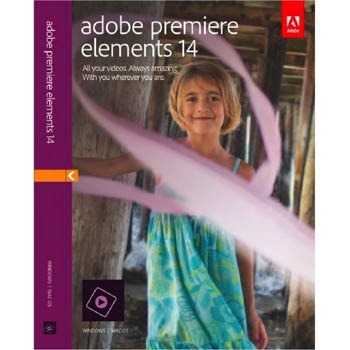 Premiere Elements is Adobe's consumer level version of it's powerful video editing program (Premiere Pro). It's affordable, and is available on both Mac and PC. I would say this is the best entry level option for PC users. 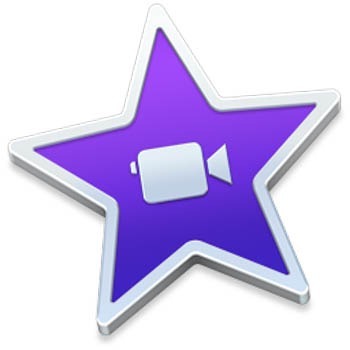 For Mac users I would recommend iMovie. 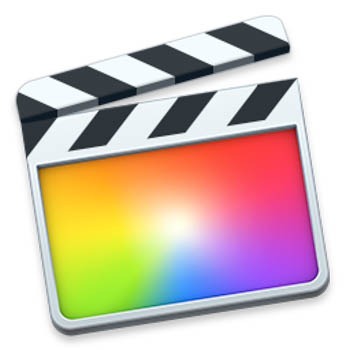 Super easy, intuitive video editing on the Mac. It's ridiculously cheap, and fun to use. This is the program we started with when were first getting into video. ​This is Adobe's professional video editing program. It's available as part of Adobe's Create Cloud for both Mac and PC. 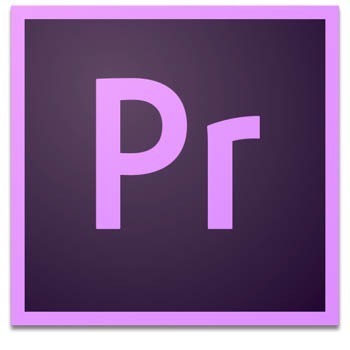 After outgrowing iMovie we moved to Premiere Pro. 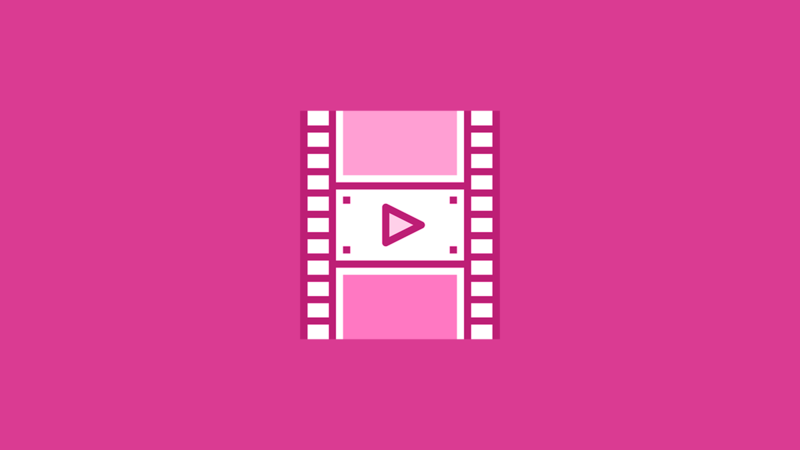 It has a pretty steep learning curve (way more features than iMovie), but after you learn the basics it's really a lot faster to work through editing a video. If you're trying to make up your mind between Premiere Pro and Final Cut then you might want to consider the pricing. Adobe charges a monthly subscription for Premiere Pro whereas you can purchase Final Cut Pro outright. If you don't need the additional programs of Creative Cloud (Photoshop, Illustrator, InDesign, etc) then Final Cut might be a more affordable option. For Apple check out their iMovie App for quick video editing on your iOS devices. 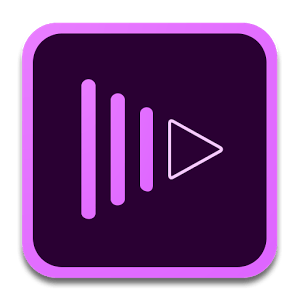 For both iOS and Android you can take a look a Premiere Clip which will also allow you to edit video on your smartphone. Want more helpful info? Join the Club! It's free! Get tons of helpful info and super useful free stuff (like eBooks, presets and more!) by joining the Photography Concentrate Explorers Club. It's totally free! To join, just put your email address in the form below, and check your inbox!